Currently the GPEPP Tissue Culture Team (check them out under "Departments") is caring and tending to successfully propagated Cyathea lunulata specimens. The Field Crew collected spores from one of the few remaining trees on the island and sent them to the Tissue Culture Laboratory for propagation. After meticulous work and what seemed like forever, the process has finally paid off! Shown below is a picture of one of the specimens showcasing its miniature sized fronds, nestling safely in an erlenmeyer flask! Enjoy!! GPEPP and Andersen CES worked together to get more Hayun lågu, Serianthes nelsonii, seedlings into their native range in protected areas. Hopefully these trees will grow big enough to increase the reproductive population on Guam. The nets are put up to prevent Eurema blanda caterpillars from laying their eggs on the leaves. Check out the article below. 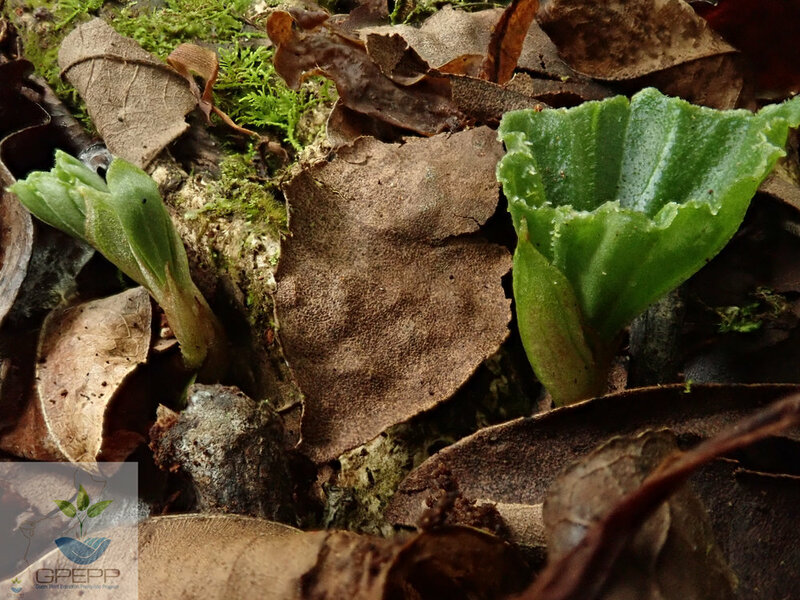 Nervilia jacksoniae is a listed plant occurring only in the Marianas Islands in shady areas with leaf litter. It is a terrestrial orchid. It is unusual in that it goes dormant for most of the year with only a small tuber underground. The first part of the plant to reappear is a small flower about 4-7cm tall. The flower itself is <1cm across with green tepals and a fringed white lip and green hairs on the mid-lobe. Unfortunately again this year we missed the flower emergence. We did find a few pods that already opened and released seed. After the flower dies away, the leaves emerge. The kidney-shaped leaves are small, only about 5 x 3 cm. 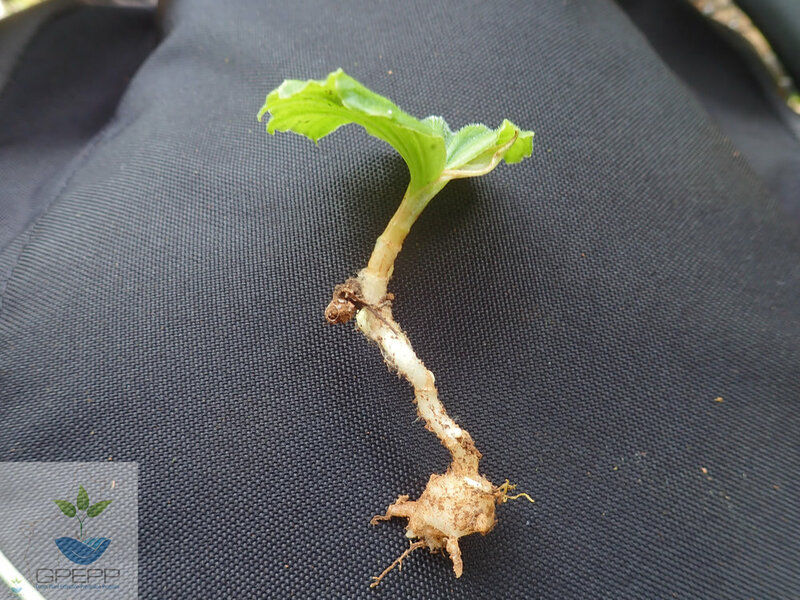 Petioles grow to 2 cm. New photos in PLANT LIST! Some species are not fully verified and have the description found in Flora of Micronesia, 5: Bignoniaceae-Rubiaceae by F. Raymond Fosberg, Marie-Helene Sachet, and Royce L. Oliver. Also check out a new pest of Tabernaemontana rotensis. This caterpillar was found munching on the tips of outplanted trees. Serianthes nelsonii only occurs in Rota and Guam. Guam has one lone mature, seed producing tree. Rota has more than 30 mature trees in the wild. Serianthes grown from Rota seeds are more vigorous than trees grown from Guam seed. Joe Tuquero, Goro, and Mario recently came back from a trip to collect DNA samples from Rota trees for comparison with Guam samples. The first day the crew met with James Manglona from Rota Forestry and toured their nursery and some of the outplanted trees. James was a huge help in locating and sharing his knowledge of Serianthes in Rota. Samples were collected from wild trees and trees that they have outplanted. Only a few leaves were needed from each tree and James fashioned a long leaf picking device for the crew to be able to reach into the canopies of these trees. A tray of Osmoxylon mariannensis and Serianthes nelsonii seedlings at the Rota Forestry nursery. Osmoxylon mariannensis seedling, a rare species only found in Rota. A healthy outplanted tree just on the side of a road. Goro, Joe, James, and Joaquin preparing to take a sample. Joe (with the leaf picker) and James looking at a large Serianthes. The Guam tree is 21.2 inches in diameter at 4.5 feet and 27 feet tall. Almost all of the wild trees in Rota are larger in diameter and height. The largest Rota tree visited was 48 inches in diameter at 6 feet and 84 feet tall! Joe next to a large wild Serianthes. Looking into the canopy of a Serianthes. We would like to thank the CNMI division of USFWS and CNMI Forestry for allowing us to visit the Serianthes in Rota. We would also like to thank James Manglona and Joaquin Fujihara for their help in the field, without them our efforts would have been unsuccessful. It's been quite some time since the last GPEPP update, so prepare to be inundated with GPEPP news. As we ended 2016 the survey crew completed rare plant surveys in Pati Point and found an abundance of Heritiera longipetiolata and Tabernaemontana rotensis, a multitude of dead and alive Cycas micronesica, and just a few Drypetes dolichocarpa, Psychotria malaspinae, and Dendrobium guamense. The survey team is now focusing efforts on rare plant surveys in the Munitions Storage Area of Andersen Air Force Base. 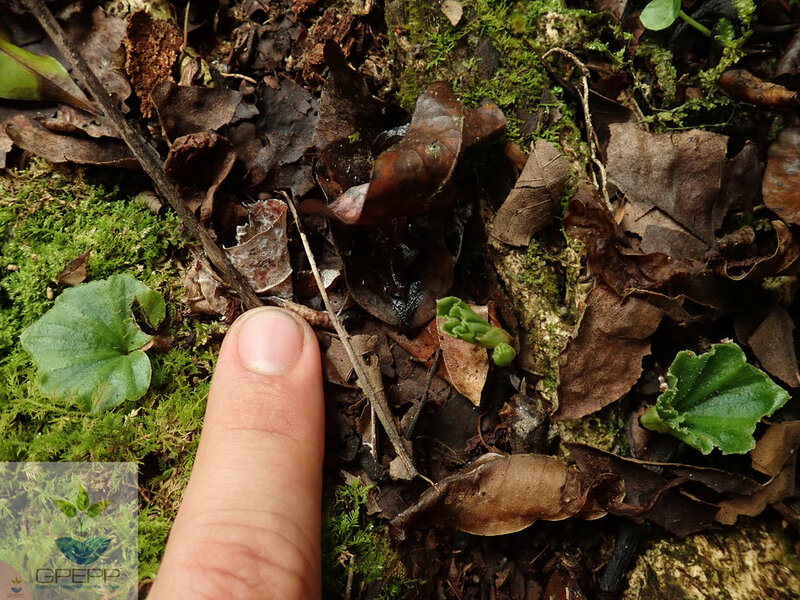 In this area the team has come across Tuberolabium guamense, Tabernaemontana rotensis, and Drypetes dolichocarpa. Tuberolabium guamense in the field growing on an Entada pursaetha vine. The nursery got a shipment of new fiberglass benches that give the nursery a whole new feel. Many Heritiera, Tabernaemontana, Psychotria, Drypetes, Fagraea, and Serianthes have found new homes out in protected outplanting sites. All the orchids have flowered and been hand pollinated and some pods have set. The Zehneria have flowered and fruits ripened and the plants look very healthy. Tuberolabium guamense flowering in the nursery. Tuberolabium flowering in the nursery. Zehneria buds, flowers, and immature fruit. Tissue culture has been successful propagating orchids and some of the smaller seeded rare plants as well as Serianthes. The next task on the list is propagation of Cyathea lunulata spores. Seed storage has been taking in the many Serianthes seeds collected from the mother tree, Hedyotis, Tabernaemontana, and Solanum. Ron working on tissue under the microscope. A naval base was opened to Chamorro traditional healers to harvest and transplant medicinal plants. Suruhana Bernice Nelson and apprentices visited the Naval Computer and Telecommunications Station wilderness Wednesday to collect plants for traditional Chamorro medicine. Marine Corps Activity Guam invited Chamorro traditional healers, or suruhanu and suruhana, to harvest medicinal plants and collect species for transplantation. New resources available on the GPEPP web site. 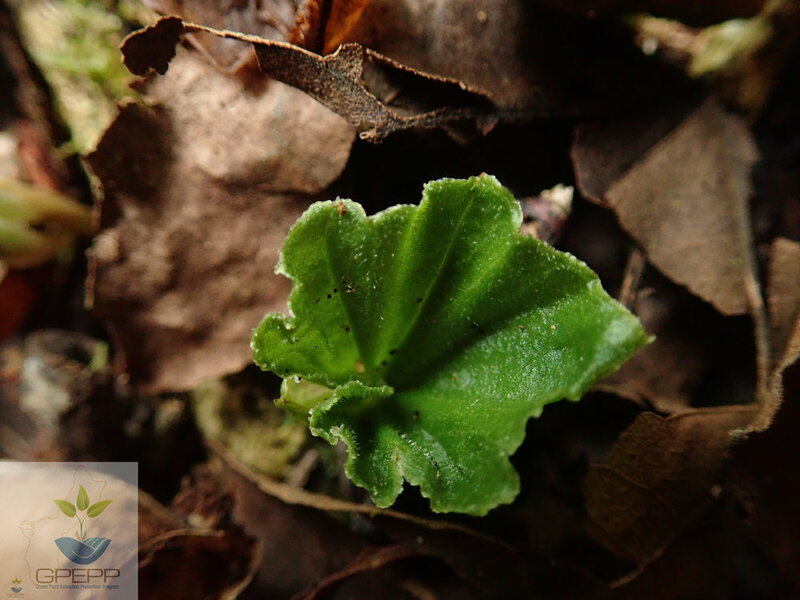 Goro has been quietly adding some field photos and information about several of our rare plant species that we have been focusing our efforts on. You can visit these pages at any time by clicking on the Plant List link at the top of the web page. You can also take a behind-the-scenes peek at some of the activities we are currently working on. Visit the Departments link at the top of the web page to see what we have been doing out in the field, maintaining our plant nursery, and working in the tissue culture lab. We have more resources coming in the near future. Stay tuned! We are working behind the scenes to bring you up-to-date news and information about our progress in saving our rare plants. We are working on a photo gallery and tidbit facts to put up soon. Also in the pipeline are a series of PDF fact sheets that will be available for download. The Bark Beetle is another threat that endangers our rare plants on Guam. 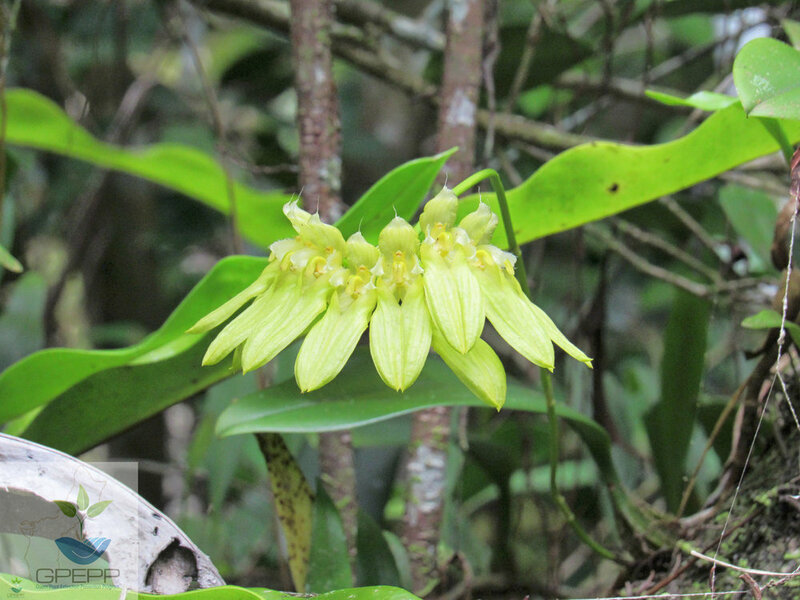 Read a report about what our partners are doing to help us protect our rare plants on Guam. Spotlight News Articles from around the region. Here is a spotlight from the University of Guam web site regarding our ongoing project for Serianthes nelsonii. Thankfully, we survived Typhoon Dolphin. Our lone Serianthes nelsonii tree is still standing tall. Here is a new article highlighting our program. The Guam Plant Extinction Prevention Program (GPEPP) is pleased to welcome a team from the Hawaii Plant Extinction Prevention Program (HPEPP) this weekend. The team will conduct a week-long training to help develop strategies to prevent Guam’s rare plants from going extinct. Guam is thankful for this unique training opportunity. We would like to invite those interested to a presentation about the PEP Programs at the University of Guam, School of Business and Public Administration, Anthony Leon Guerrero, Room #129 on Thursday, June 12 from 3:30 PM until 5:00 PM. Presently, Hawaii is home to 235 ‘PEP species’, which are species that have fewer than 50 plants remaining in the wild. 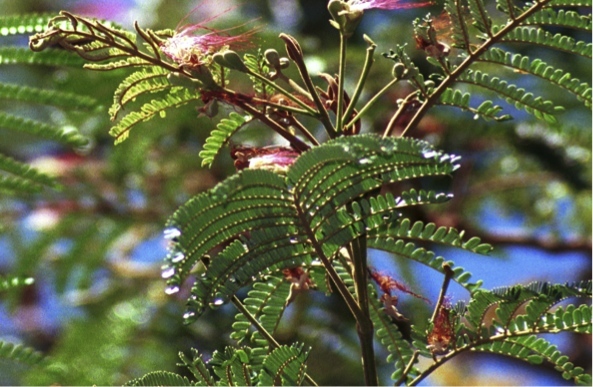 The Hawaii PEP Program is a project of the Pacific Cooperative Studies Unit at the University of Hawaii and works collaboratively with landowners and government agencies statewide to protect Hawaii’s rarest plants. This training is funded by the US Department of Agriculture, Forest Service Private and State Forestry Grant, US Fish and Wildlife Service, and Hawaii Division of Forestry and Wildlife. 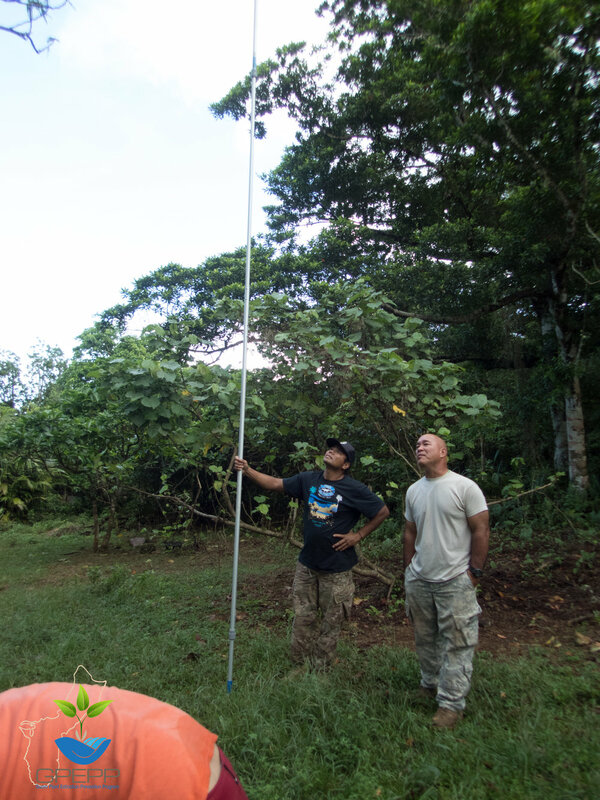 The GPEP Program was initiated through a collaboration of the University of Guam, College of Natural and Applied Sciences and the Forestry & Soil Division of the Department of Agriculture with the Hawaii PEP Program. At the moment, the Guam PEP Program receives funding primarily from the U.S. Forest Service State-Private Stewardship grant. Guam PEP is pleased to announce their new partner, the U.S. Fish and Wildlife Service. The new funding will allow us to work on more PEP species. GPEPP values public input and participation. 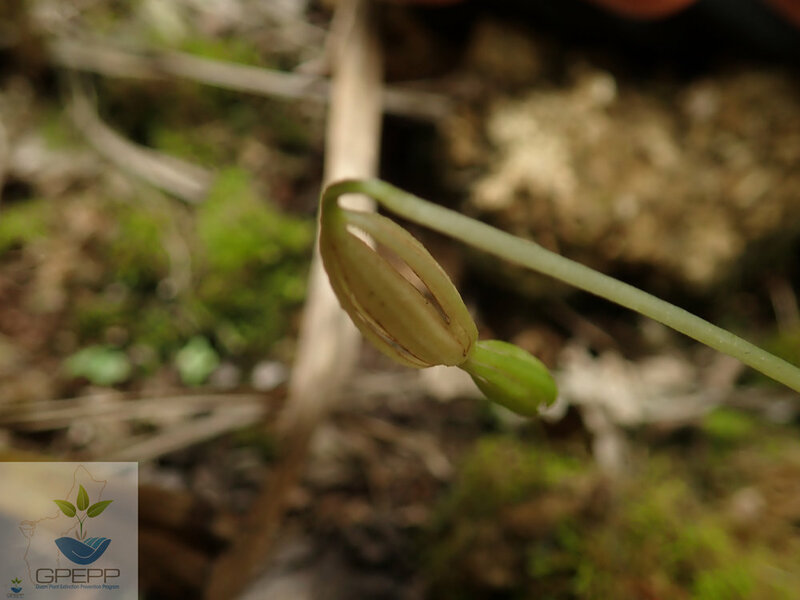 We hope to share knowledge and find ways to protect our rarest plants in the Mariana Islands. We are also looking to develop local and regional partnerships that encourage shared responsibility for protected species management and recovery, which could help reduce the risk of extinction of many of these species. We welcome your participation. 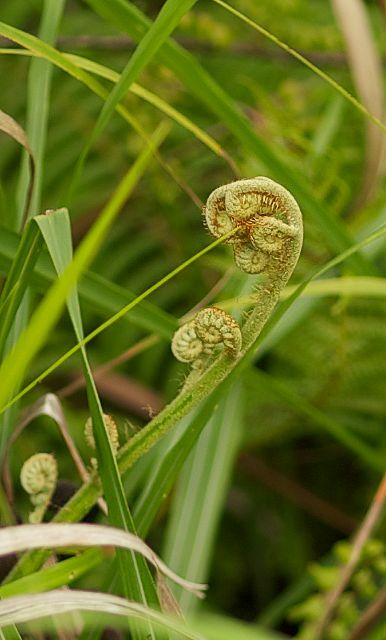 The Guam Rare Plant Restoration Group is a group of Guam native plant specialists whose expertise is used to review program objectives, provide recommendations, and follow up with the GPEPP progress, and acts as GPEPP’s advisory committee. 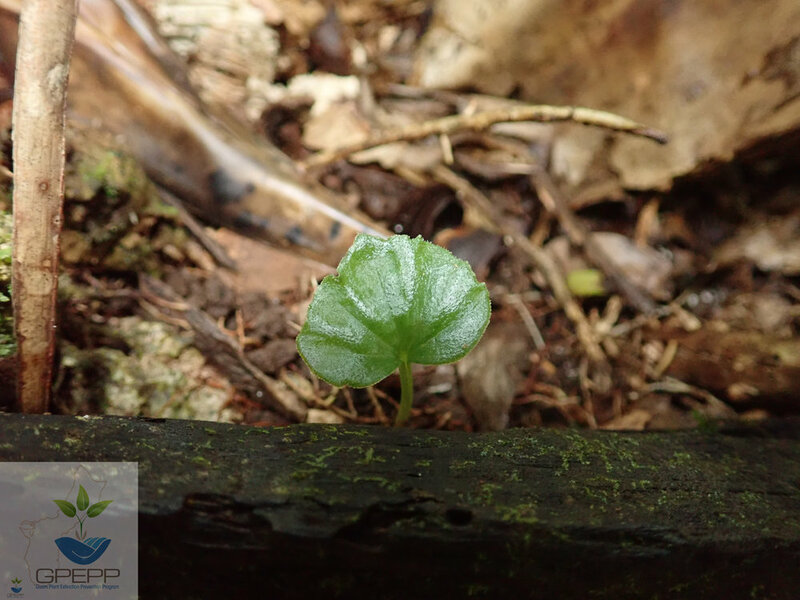 The GPEP Program is an island-wide program dedicated to preventing the extinction of Guam’s rarest plant species that have fewer than 200 individuals remaining in the wild by working with conservation partners to protect wild populations, preserve their genes off-site, and reintroduce plants to their natural habitat. GPEPP wants to reverse the trend toward extinction by managing wild plants, collecting seeds and vegetative propagules and establishing new populations. At the moment, GPEPP is setting up a seed storage facility, a tissue culture lab, and rare plant nurseries. Serianthes nelsonii or Håyun lågu is one of the largest endemic trees in the Marianas but only one tree survives in Guam. Serianthes nelsonii is listed as Endangered on the Red Data List for Plants, the Commonwealth of the Northern Mariana Islands Endangered Species List, and the Guam Endangered Species List. At the moment, GPEPP is focusing its work on this species. The Guam Pacific News Center report talks about "The Last Tree on Guam." The WPTRC 2014 Impact Report has been released! We are featured in the WPTRC 2014 Impact Report. We have been working behind the scenes and are excited about the new things that we will be producing in the near future. Keep in touch with us to learn about the exciting new developments coming soon! We have released the first four field guides for Cyathea lunulata, Syzgium thompsonii, Serianthes nelsonii, and Zehneria guamensis. These are double-sided half-page field guides that you can take with you on the field. They have pictures that will help you identify plants around Guam. On the bottom of each field guide, you will find a QR code that you can use with your smartphone to connect to the web page containing more information regarding your plant. Right-click on the links and select "download file" from the popup menu. Note: These files can be read with Adobe Acrobat Reader 5 and later. Please check to see if you have the latest Adobe Acrobat Reader. Guam Plant Extinction Prevention Program brochure and poster now available for download! We have finished producing a brochure and a poster for use in your organization. Enjoy! A workshop on protecting and preserving Guam's rare plants will be presented by the Guam Plant Extinction Prevention Program (GPEP). Contact us at plants@gpepp.org or (671) 735-2129 for more information.